“Surreal.” “Extraordinary.” “Disgraceful.” Lawmakers in the U.S. and abroad appeared shell-shocked on Monday following President Trump’s press conference with his Russian counterpart, Vladimir Putin, in which Trump again refused to condemn Putin for Russia’s interference in the 2016 election, even going so far as to deny the conclusion of U.S. intelligence agencies that Russia was responsible. “We should have had this dialogue a long time ago, before I got to office,” Trump continued. 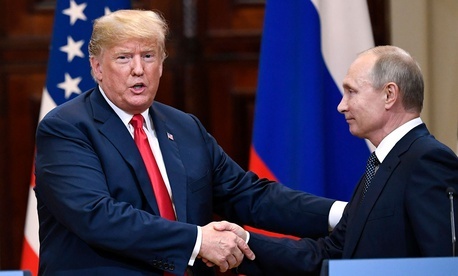 “And I think we are all to blame.” Asked later whether he would denounce Russian interference and ask Putin to never do it again, Trump said he didn’t “see any reason why it would be Russia” that interfered, and began discussing the Democratic National Committee server that, according to the Justice Department, was hacked by Russian intelligence officers in 2016. “I really want to see the server,” Trump said, appearing to cast doubt on his administration’s conclusions. (The FBI obtained copies of the DNC server from the private firm hired to investigate the hack). Trump has been famously reluctant to publicly accept the assessment from U.S. intelligence agencies that the Kremlin engaged in an influence operation designed to defeat his Democratic rival, Hillary Clinton, and put the New York real-estate tycoon in the White House, calling the investigation into that interference a “witch hunt.” Yet the investigation into the Russian operation and potential ties to the Trump campaign has continued to produce indictments and even convictions of former Trump officials, including Trump’s former National-Security Adviser Michael Flynn and his former campaign manager Paul Manafort. Last May, Trump fired then–FBI Director James Comey, an act that ultimately prompted the appointment of Special Counsel Robert Mueller. But while the president has subjected just about every player in the Russia investigation to some kind of belittling invective, he has consistently spared Putin from criticism. That fact is likely to draw even more scrutiny after Trump’s performance in Helsinki. Trump’s remarks—made three days after Special Counsel Robert Mueller’s indictment laying out in extraordinary detail how Russia’s military intelligence agency hacked Democratic organizations and timed the release of the stolen material to have the maximum impact on the election—drew rebukes both implicit and explicit from those close to, and within, Trump’s own administration. At an event held by the Atlantic Council, a Washington, D.C.–based foreign-policy think tank, Senators Mark Warner and Marco Rubio, along with members of parliament from Ukraine, Latvia, the Czech Republic, and the United Kingdom, communicated their firm belief to reporters that Congress would reject attempts by Trump to dramatically shift U.S. policy in favor of Russia. Republicans in Congress have been reluctant to challenge Trump, but on Russia matters, many have come out swinging along with their Democratic colleagues. Ojars Kalnins, a member of parliament in Latvia, reiterated that the military threat posed by Russia “became very real after 2014,” when Russia annexed Crimea from Ukraine. “But there has also always been a political threat, an attempt to undermine our democratic system from within.” Hanna Hopko, a Ukrainian lawmaker, appeared rattled by the president’s remarks, but did not call him out by name. “Everybody expected that there would be painful compromises,” she said, noting that Ukraine had watched the Trump–Putin press conference intently. “But it is important to see this very firm position from the U.S.: Crimea belongs to Ukraine.” Trump has not ruled out recognizing Russia’s annexation of Crimea as legitimate.